I need a hat and scarf for the purple coat I will be making soon. I have yet to find a pattern for a woven hat, so I thought I would make one based on a simple knitted hat pattern by Mary Grindling. In her pattern the stockinette stitch is worked until the piece reaches 17 inches. The two long ends are sewn together and the top is gathered closed. The bottom is folded over to make a band. Real easy! I threaded 32 pegs with 41 inch long pieces of yarn for the loom and worked plain weaving until I reached about 16 inches. I removed the fabric from the loom and tied the top portion, 2 weft or peg sections together, across. I then sewed the long ends together. After that, I used the base of the weft ties to gather the top closed. I did not want a pompom, so I cut the ends of the ties and placed them on the wrong side of the hat. To finish the bottom, I tied knots around the double weft strands with pieces I cut from the ball. Loose strands were woven into the body of the hat. I cut the weft strands to 1 inch and frayed the ends with a comb. I used almost the entire chunky pots ball (Paintbox Yarns), which is 297.5 yards. It turned out that 17 inches woven makes a slouchy hat. 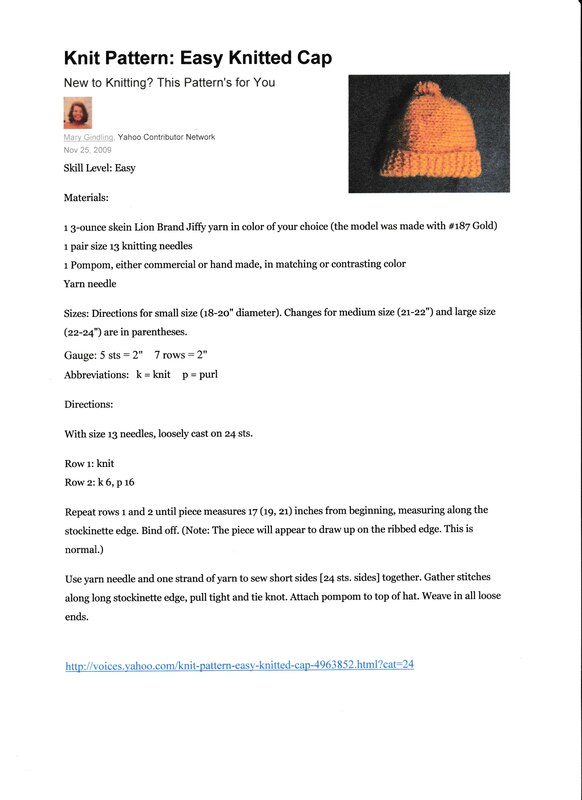 The knitted hat I made using the simple hat pattern was not slouchy. I like slouchy hats, so I am happy with the look. My head measures 22 inches and the hat fits snugly. If I were to make this hat again, I would thread 33 pegs as I could stand a slightly looser fit. My next loom project will be a scarf to coordinate with this hat. Thank you so much for sharing this tutorial. I just purchased my first peg loom. You’re welcome! I hope you enjoy using the loom and making projects.